After two straight weekends of dominance by *checks notes* uh, absolutely nothing, we have three new wide releases in what's about to rapidly become a crowded marketplace, with Christmas fast approaching. As we finally come out of The Void (let us never speak of it again, at least until next year), a brief reminder that since this is the first December in three years without a Star Wars movie, please keep in mind that those movies broke the cardinal rule of the holiday box office money train: it's a marathon, not a sprint. Don't forget that just a year ago, Jumanji: Welcome to the Jungle turned a $36.1 million weekend into $404 million, while The Greatest Showman started with $8.8 million and became one of the leggiest films of all time with $174 million. While next December Episode IX beckons and threatens to ruin perspective all over again, don't worry about opening weekends and look for the long game over the next three weeks or so. With that said, the number one film on the weekend is Spider-Man: Into the Spider-verse, earning $35.4 million. This is an outstanding start and it's looking to be a huge winner over the holiday season. 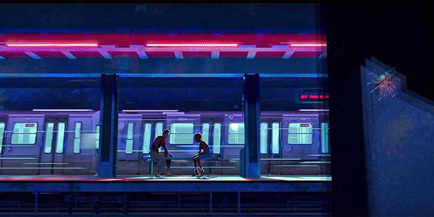 An animated Spider-Man story that goes deep for the comic nerds (featuring Miles Morales as the main character, Gwen Stacy/Spider-Woman and Spider-Ham/Peter Porker, with Peter Parker practically relegated to "and the rest" status), Into the Spider-Verse is a late entry for upset of the year, earning ridiculously positive reviews (97% Fresh, which was still 100% Fresh about ten days ago) and likely swooping in and stealing the Best Animated Feature Oscar from Pixar. Going with a totally unique animation style paid off, in addition to quality writing (from the team of Lord & Miller, likely responsible for something you found great that you didn't realize was them). Again, if this number feels low, don't worry. This is exactly the kind of opening that the holiday season turns into huge box office. Christmas is just nine days away and the week that follows is simply magical. At a bare minimum, I think Into the Spider-Verse is looking at $200 million. On top of that, this is a huge, huge win for Sony, who seem to have righted the ship on their piece of the Marvel Cinematic Universe; not only was Spider-Man: Homecoming a solid reboot last year (with the sequel coming next summer), they've now got a potential animated Spider-Man franchise as well. Another new release takes second place as Clint Eastwood's The Mule earns $17.2 million. The based on a true story drama is directed by and starring Eastwood (the second film he's directed this year, after 15:17 to Paris), The Mule had some early Oscar buzz (as do most of his films) but that faded away fast, as it rated 62% Fresh at Rotten Tomatoes. With what's a fairly light (on subject, not quantity, of course) slate of movies coming out this Christmas season, a drama can still succeed and this has the pedigree to do so. It's a solid enough start that it can hang in there over the next few weeks, and we'll look to see if it can reach the $100 million mark. As we get closer to Christmas, The Grinch continues to hold strongly, taking third place in its sixth weekend with $11.5 million, off just 23% from last weekend. It's got $239.2 million in the bank so far. If the legs don't immediately fall off as soon as we reach Christmas Day, it's going to flirt with the $300 million mark (but ultimately fall a little bit short). Weirdly, Dr. Seuss doesn't play well overseas as it's earned just a little over $100 million internationally, but Universal should still be very excited about this performance and future animated Seuss projects. A third animated film takes fourth as Ralph Breaks the Internet drops down after three weekends at the top, adding $9.5 million (down 41%) and giving it $154.4 million in four weekends. It's still slightly ahead of Wreck-It Ralph at the same point ($150.3 million), but lagging behind Moana ($162.9 million) and ahead of Coco ($150.7 million) which were Disney's previous Thanksgiving animated releases. Both took advantage of the 12 Days of Box Office to reach $200 million (though Coco didn't get there until January) but Ralph Breaks the Internet doesn't look to be as lucky. It's a prime candidate to start giving up its screens to the Christmas releases and also just doesn't have the staying power of the two other films (Ralph was $11.8 million ahead of Coco after its first weekend, that gap has closed considerably). I think its best case may be the $189.4 total of Wreck-It Ralph, maybe a few bucks more. Fifth place goes to our third opening film, and while Spider-Man: Into the Spider-Verse and The Mule are primed for solid December runs, Mortal Engines is...not, earning just $7.5 million. Co-written and produced by Peter Jackson, it's about a futuristic steampunk, post-apoctalypic society where cities are mobile monstrosities. It's based on a novel, and there's a whole lotta CGI involved. It was wrecked pretty hard by critics (just 28% Fresh) and really the most recognizable name in the cast is Jackson regular Hugo Weaving. Points for something different, but it looks like something went wrong in the execution. Normally we try to be positive about box office here, especially this time of year, but this is much too low of an opening for it to be a significant factor during the end of year box office bonanza, especially with a crush of new releases out between now and Christmas. It might be alright when you throw in overseas grosses, but with it's budget anywhere from $100-150 million, it's going to go down as one of the bigger misses of the year. Wrapping up the chart this week with some older releases all about to swept out of the way, Creed II adds $5.3 million and is the most likely of these candidates to hang on for a couple more weekends as a lower tier earner. It's got $104.8 million in four weekends, so by next week it'll have topped Creed's $109.7 million. Bohemian Rhapsody continues to rock along with $4.1 million and $180.4 million in seven weekends. Watch the next couple weekends to see if it can get to $200 million, or if it's going to be cannibalized for its screens. Instant Family continues to show that it was released a few weeks too early, with $3.7 million and $60.2 million in five weekends. Come on, Mark, don't you want to be the king of the blandly inoffensive December family comedy? The title is right there for the taking! Fantastic Beasts: The Crimes of Grindelwald keeps stumbling along with $3.6 million and $151.6 million in five weekends. While no chance of coming close to the $234 million of the first one, it's still approaching $600 million worldwide (the first one did $800 million), so they'll keep on coming, with the next one penciled in for the weekend before Thanksgiving in 2020. Green Book wraps up the top ten with another good hold, down 29% to $2.7 million and a total of $24.6 million. It's never played in more than 1,215 theaters and will likely be kicked out of the top ten after this weekend, but is considered a lock for a Best Picture nomination. Just missing the top ten was a re-release of Deadpool 2, made PG-13 (you know, for the kids) and wrapped in a bevy of Princess Bride references (even including Fred Savage), but it earned just $2.6 million. Titled Once Upon a Deadpool, it will have to settle for a total of $322.3 million and missing the point of the character by going with a PG-13 rating. The top 12 films this weekend earned $106.1 million, which I really won't bother comparing to this weekend last year when Star Wars: The Last Jedi opened to $220 million. Sorry. Next weekend is when things really start to get crazy, with Aquaman (DC may have made another good one! ), Mary Poppins Returns (hoping to capture the same musical magic that The Greatest Showman did) and in the upset of the year, Transformers spinoff Bumblebee (currently rating 97% Fresh at Rotten Tomatoes).